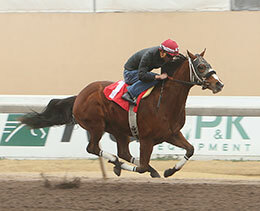 Jc Storm, under jockey Alfredo Triana, Jr., posting the fastest schooling race time on Wednesday at Remington Park. OKLAHOMA CITY, OK—FEBRUARY 5, 2019—The initial day of training races in preparation for the upcoming American Quarter Horse, Paint and Appaloosa season at Remington Park, is in the books. The top time of the session went to JC Storm in the first event of the day. Cool temperatures in the mid-30s and foggy skies set an interesting atmosphere as horses used the training races to prove their readiness for actual competition. Owned by Jose Cervantes of Mustang, Okla., and trained by Luis Villafranco, JC Storm won the opening 250-yard race in 13.851 seconds over a fast track, with the help of a slight northeasterly tailwind of 6 mph. Ridden by Alfredo Triana, Jr., JC Storm came away sharply at the start and after a couple of taps from the jockey, was flying along the rail from her inside post position. She glided home while in-hand over the final yards to cross the wire 2-¼ lengths ahead of her nearest rival. JC Storm is a 2-year-old Oklahoma-bred filly by Ivory James from the Stoli mare Oh Cherokee Rose. Tf Kates Tlc record, by champion sire The Louisiana Cartel, posted the second fastest clocking of :13.86 seconds in Race 7. Trainer Roberto Treto saddled the $8,000 Heritage Place Yearling Sale graduate for owner Humberto Gutierrez. The bay filly is out of the stakes winning and stakes producing Stoli mare XO Kate. Second-crop sire Coronado Cartel had two winners on Wednesday training race card. Dtl Smooth Criminal, a paint colt from the Mr Eye Opener mare Eysa Savvy Queen posted the third fastest time of :13.93 seconds. Matt Whitekiller conditions Dtl Smooth Criminal for owners Tonya and Dean Lester. Coronado Cartel's first winner of the day came in Race 3 when Wl Cash Me Outside completed the 220 yards in :13.94 seconds to post the fourth fastest clocking. Charles and Elizabeth Horton own the brown filly out of Gold Medal Jess by Mr Jess Perry. Luis Villafranco is the trainer. Other sires with winners on Wednesday were first-crop sires Separate Interest and Wagon Tales and Freighttrain B and The Dashing Hero. Villafranco and Whitekiller were the only trains with multiple winners, each getting two. CLICK HERE for a complete list of today's results by time.